Analog scale scores for self-rated cocaine craving (A) and anger (B) in response to mental imagery of personalized scripts describing autobiographical memories of cocaine use and anger-provoking situations, respectively. Data are from 9 cocaine-dependent men. Means ± 1 SD of analog scale scores for each trial are provided in the left and right margins of each figure. A, Example (subject 8) of heart rate (beats per minute) response to script-guided imagery of the cocaine use, anger-related, and control scenes, and a rest condition. The time of injection of water O 15 and coincident end of script presentation are indicated on the abscissa. B, Area-under-the-curve (AUC) differences for individual heart rate × time relationships for cocaine use and anger script imagery compared with the common control scene imagery condition. Data are from 9 cocaine-dependent men. Location of significant (P<.005) sites of increased blood flow in difference images contrasting the drug use and neutral scene imagery (A) and the drug use and anger-related scene imagery (B) conditions. Data are from 8 cocaine-dependent men. Significant pixels are illustrated on parasagittal (numbers refer to distance in millimeters from midline) magnetic resonance reference images of the left and right hemisphere averaged from a separate group of subjects. Location of brain activity correlated with both induced cocaine craving and anger for 8 cocaine-dependent men. Maps of pixels in which individual subject regional cerebral blood flow was significantly positively correlated (P<.05, 2-tailed) with individual-subject cocaine craving (yellow) on axial magnetic resonance reference images averaged from a separate group of subjects. Those pixels that were correlated with both cocaine craving and anger (blue) are illustrated. Correlation maps at different axial planes represent the superior or inferior distance from the commissural line. Background Crack cocaine dependence and addiction is typically associated with frequent and intense drug wanting or craving triggered by internal or environmental cues associated with past drug use. Methods Water O 15 positron emission tomography (PET) studies were used to localize alterations in synaptic activity related to cue-induced drug craving in 8 crack cocaine–dependent African American men. In a novel approach, script-guided imagery of autobiographical memories were used as individualized cues to internally generate a cocaine craving state and 2 control (ie, anger and neutral episodic memory recall) states during PET image acquisition. Results The mental imagery of personalized drug use and anger-related scripts was associated with self-ratings of robust drug craving or anger, and comparable alterations in heart rate. Compared with the neutral imagery control condition, imagery-induced drug craving was associated with bilateral (right hemisphere amygdala activation greater than left) activation of the amygdala, the left insula and anterior cingulate gyrus, and the right subcallosal gyrus and nucleus accumbens area. Compared with the anger control condition, internally generated drug craving was associated with bilateral activation of the insula and subcallosal cortex, left hippocampus, and anterior cingulate cortex and brainstem. A brain-wide pixel-by-pixel search indicated significant positive and negative correlations between imagery-induced cocaine craving and regional cerebral blood flow (rCBF) in distributed sites. Conclusions The collected findings suggest the craving-related activation of a network of limbic, paralimbic, and striatal brain regions, including structures involved in stimulus-reward association (amygdala), incentive motivation (subcallosal gyrus/nucleus accumbens), and anticipation (anterior cingulate cortex). THE PROGRESSION to cocaine addiction and its chronically relapsing nature is often attributed to frequent and intense bouts of drug craving that are triggered by environmental and internal stimuli that have established conditioned associations with cocaine-induced euphoria or withdrawal.1 Places, people, actions and sensations associated with past drug use, and their collection as episodic memories thus represent conditioned cues that trigger drug craving as a conditioned response. An understanding of the regional brain activity that underlies this drive state could define mechanisms of relapse following abstinence, and potentially guide the development of new treatments for addiction. Cocaine craving is also experienced following cocaine administration,2 and it may motivate the binge abuse of cocaine through the activation of similar or different neural pathways. Animal models of drug craving3 have identified possible neurobiological4-6 substrates of craving, yet their translation to a definitive picture of the neural correlates of human drug craving remains unknown. Functional neuroimaging techniques such as positron emission tomography. Positron emission tomography (PET) and functional magnetic resonance imaging (fMRI) are redefining the relationship of the human brain to behavior. Drug craving in addicted individuals poses significant challenges to study using PET or fMRI because of its contextual specificity, subjective nature, and multiple cognitive and physiological corollaries. Using videotape simulations of cocaine use and drug paraphernalia as generalized inductive cues, previous PET and fMRI studies have identified frontal and limbic activations associated with cue-induced craving.7-9 Such cues, however, induce variable urges for cocaine use10,11 and do not parse activations related to conditioned drug craving from activations associated with accompanying features of psychophysiological arousal, anticipation, memory retrieval, attention, and behavioral planning. To address these limitations, we developed and implemented alternative craving induction techniques and multiple control conditions with PET to isolate further the neural correlates of cue-induced cocaine craving in human cocaine addiction. Using guided imagery of autobiographical memories of cocaine abuse as novel personalized cues, we investigated the neural correlates of cue-induced cocaine craving in crack cocaine–dependent male volunteers. Positron emission tomography images were acquired during the guided imagery of individualized scripts describing memories of cocaine use or of an anger-related or emotionally neutral non–drug-related experience. The anger and neutral scene imagery tasks served as control conditions for the arousing, attention-grabbing, anticipatory, and vivid episodic memory properties of the drug use imagery condition and for the processes of recall of autobiographical memories and their mental imagery. As a primary analysis, comparisons of task-related regional cerebral blood flow (rCBF), a correlate of neuronal activity,12 between the drug use and control imagery conditions were used to identify synaptic activity related to cocaine craving in dependent men. This study tested the overall hypothesis that cocaine craving associated with addiction is related to changes in limbic and frontal brain activity that can be dissociated from activations related to corollaries of drug craving. The participating subjects were 8 healthy African American men (7 right-handed and 1 left-handed; mean ± SD age, 36 ± 6 years) who were admitted for inpatient treatment of cocaine dependence (a comparative imaging study in cocaine-dependent women is ongoing). The study design did not include an exclusion criteria based on race, though African Americans were encouraged to participate as a disproportionately affected ethnic group. 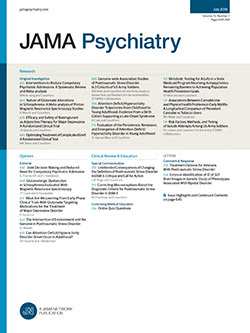 As established by clinical interview by an addiction psychiatrist, all participants met the following study diagnostic criteria: (1) DSM-IV defined active crack cocaine dependence, but not for opiates, ethanol, marijuana, or benzodiazepines (1 subject fulfilled criteria for nicotine dependence, and 1 subject fulfilled criteria for marijuana abuse); (2) a lack of other Axis I or Axis II psychiatric disorders, or current or prior neurologic disease; and (3) lack of and no history of a major medical illness or current use of prescription medications. Additional inclusion criteria included (4) positive urinalysis for cocaine at initial visit and (5) use of cocaine as smoked free-base. Subjects had a mean ± SD lifetime history of cocaine abuse of 10 ± 6 years, and they had reported the use of cocaine to be an average of 19 of the 30 days prior to admission (range, 3-30 days). All subjects upheld that exposure to drug use reminders was associated with an increased desire to use cocaine. Potential subjects were screened for mental imagery ability using the 35-item Questionnaire on Mental Imagery (QMI),13 and subjects exhibiting above-average ability (QMI score, <87)14 were invited to participate. Participating subjects also were selected for the presence of frequent (> 5 per day), intense (mean ± SD rating, 7.7 ± 2.1 of a possible 10) cocaine cravings during the week preceding study involvement using the Minnesota Cocaine Craving Scale.15 Positron emission tomography images were acquired at a stage of early withdrawal (range, 7-17 days), associated with relief from initial mood and cognitive symptoms of a dysphoric syndrome,16 and when the rCBF measures would not be confounded by the direct effects of cocaine on cerebral hemodynamics.17 Immediately prior to imaging, subjects were established as being drug-free by urinalysis for drugs of abuse. Subjects gave informed consent to participate in a study protocol approved by the Human Investigations Committee at the Emory University School of Medicine, Atlanta, Ga. I'm driving to the apartment complex, knowing that I'm going to see a dealer I know. It's very dark, but through the trees I can see guys hanging out. I feel butterflies in my stomach. At this point, as I feel the anticipation build, I park the car and out of the shadows P____ walks up. I know he's got some good stuff. I'm so excited now I can feel my stomach churning. P___ puts a 50 cent piece in my hand. I feel jittery now, I can't wait to get high. We get in the apartment. It's a mess, but I see the stem and lighter that I need. I take a look at the rock, it's yellowish and hard and it looks so good my heart is racing now. I know this is gonna be it, pure bliss. Trembling, I take the stem and the lighter. I watch the flame melt the rock. I'm going to burst now. I put the stem to my lips and I inhale, this is the one. Task-related rCBF was determined with the ECAT 951 PET scanner (Siemens, Knoxville, Tenn) following the bolus intravenous administration of 45 mCi of water O 15.20 Each participant was scanned 8 times in an imaging session, twice in each of 4 conditions: rest, neutral script imagery, cocaine use script imagery, and anger script imagery. The same order of conditions was repeated with 10 minutes between each condition. Imagery scripts were presented binaurally with instructions to listen to the script and then mentally reenact the scene described. Tracer administration was coincident with the end of each script, and 90-second single-frame studies were initiated by the detection of head radioactivity and acquired in a 2-dimensional mode. Differences in responses to script imagery between individuals, conditions, and trials were estimated subjectively by analog scale responses, and objectively by heart rate measurements. Following offset of the scanner, the inductive properties of the imagery scripts were evaluated for each condition using 0- to 10-point analog scales with which the subjects self-rated the vividness of the mental image (for all imagery scenes) and the experience of drug craving during imagery of the cocaine use scene, anger during the anger-related scene, or relaxation during the beach or forest scene. Subjects were asked, "how vivid was the image?" for all scenes; "how strong was the urge to use?" for the cocaine use scene; and "how angry are you?" for the anger scene, with the anchor points for each of these 3 scales labeled "not at all, none" for 0, to "a great deal" for 10. For the neutral scene, subjects were asked, "how relaxed are you?" with the anchor point 0 labeled "very relaxed, no tension at all" and 10 labeled "very tense." The possibility of cocaine craving provocation during anger scene imagery or of anger induction during cocaine use imagery was also assessed by analog scale responses. Attempts to limit carryover of an induced state into the subsequent image acquisition involved the engagement of the subject in conversation related to his or her predetermined occupation or hobbies. Heart rate measurements were recorded at 10-second intervals for the 30 seconds prior to script exposure (baseline), and during the following 180 seconds encompassing script listening and scene imagery. Script-guided imagery was not associated with increased reports of anxiety as assessed by the State-Trait Anxiety Inventory21 administered prior to and immediately following the imaging session. Intact sets of 8 scans were acquired for 8 subjects and were the basis of image analysis; scans for 2 subjects were discarded owing to missing behavioral or imaging data. Images were reconstructed using a measured attenuation correction. The 2 PET scans for each condition were averaged, spatially normalized,22 normalized for global blood flow by proportionate scaling, and coregistered23 with a population-representative reference PET atlas centered in Talairach coordinates.24 Coregistered PET images were smoothed to a final isotropic resolution of 9 mm full-width at half maximum. A linear contrast analysis25 based on the general linear model26 used a 2-way repeated-measures analysis of variance (ANOVA), which compared means across 4 linear contrasts. A t-map image for each contrast was calculated on a pixel-by-pixel basis. Significant sites of activation were defined by pixel intensity (P<.005) and a spatial extent of at least 50 contiguous pixels exceeding this probability level. During script construction, the cocaine-dependent subjects readily described vivid episodic memories of ritualistic acts of cocaine use and anticipatory arousal. The decomposition of these memories into scripts and their subsequent use with guided imagery as personalized drug use cues was associated with significant self-rated drug craving and alterations in heart rate. During the PET imaging session, craving analog scale scores reflected a moderate to intense urge to use cocaine for both replications of the cocaine use scene imagery (Figure 1), and they did not differ between replications (paired t8 = 1.31, P = .23). Anger analog scale scores reflected the experience of moderate to intense internally generated anger for both replications of the anger scene imagery (Figure 1), and they did not differ between replications (paired t8 = .704, P = .50). Anger-related script imagery was associated with only mild to no self-rated cocaine craving (mean ± SD score for "urge to use?" in trial 1 = 2.3 ± 1.4; trial 2 = 0.3 ± 0.2) and was significantly less than the cocaine craving response to imagery of the cocaine use script (trial 1, t14 = 5.81, P<.001; trial 2, t14 = 10.03, P<.001). Furthermore, cocaine use script imagery was associated with little or no self-rated anger (mean ± SD score for "angry?" in trial 1 = 1.1 ± 1.1; trial 2 = 0.4 ± 0.3). All of the subjects rated the mental image of their drug use, anger, and neutral scenes as being highly vivid (mean score range, 8.5-9.4). The provocation of cocaine craving or anger using guided imagery of personal cocaine use or anger experiences was associated with significant and similar alterations in heart rate (Figure 2). Compared with the neutral control imagery condition, the absolute area-under-the-curve values defining the heart rate × time relationship were significantly greater for both the drug use script imagery (paired t8 = 4.37, P = .002) and anger script imagery conditions (paired t8 = 6.14, P<.001). Area-under-the-curve values for the control script imagery and rest conditions did not differ significantly (paired t8 = 0.68, P = .52). Compared with neutral scene imagery, drug use imagery was associated with the activation of the amygdala (right hemisphere amygdala activation greater than left), the left insula and anterior cingulate gyrus, and the right subcallosal gyrus and nucleus accumbens areas (Table 1 and Figure 3). When compared with the neutral imagery condition, drug use imagery was also associated with decreased activity in the right frontal and left temporal cortices and the posterior insula. Compared with anger scene imagery, drug use imagery was associated with sites of activation in limbic and paralimbic brain structures, including the bilateral insula and subcallosal cortices, the left posterior caudate nucleus area, and the anterior cingulate cortex and brainstem (Table 1 and Figure 3). Normalized difference images from this contrast also revealed decreased activity in the right middle frontal and fusiform gyri and in the left middle temporal cortex. For those significant (P<.005) activation sites identified in difference images, Pearson product moment correlation coefficients were used to examine the relationship between individual changes in rCBF and self-rated cocaine craving. For the contrast of the drug use and neutral scene imagery conditions, significant negative correlations between changes in rCBF and cocaine craving scale scores for the right subcallosal cortex (r = −0.89) and the left anterior insula (r = −0.74) were noted. For the difference image for the drug use and anger scene imagery conditions, significant (P<.05) negative correlations of rCBF with self-rated cocaine craving were observed for the brainstem (r = −0.71) and left posterior caudate nucleus (r = −0.77). Significant positive correlations to self-rated craving were not observed in this region of interest correlation analysis. For the brain-wide search, significant (P<.01) positive correlations were found between individual subjects' self-rated cocaine craving in response to drug use script imagery and rCBF in the right fusiform gyrus (+34 mm [x], −24 mm [y], −24 mm [z]), and in the left middle frontal (−52 mm [x], +4 mm [y], +43 mm [z]) and temporal (−56 mm [x], −16 mm [y], −8 mm [z]) gyri. Additional positive rCBF correlations for the left middle frontal gyrus and insula, and the right thalamus and cerebellum were common to both craving induced by drug use imagery and anger induced by anger experience imagery (Figure 4). Similarly, most significant (P<.01) negative correlations of rCBF to drug use script–induced craving as identified in the pixel-by-pixel correlation analysis were also shared with the anger response to the anger script imagery condition; nonshared correlations were noted in the right anterior cingulate gyrus, and in the left putamen and inferior parietal cortex. When corrected for the processes of mental imagery and memory retrieval, this study's findings in cocaine-dependent men indicate a cocaine craving–related activation of a network of paralimbic (insula, anterior cingulate, temporal cortex), limbic (amygdala), and ventral striatal structures. These task-related brain activations provide insight into the identity of the neural pathways through which conditioned drug cues provoke intense drug craving and thereby redirect behavior toward drug seeking and drug use activities. The observed activation of the amygdala during internally generated cocaine craving has been previously observed in response to distinct external drug use cues (videotape depiction, handling of paraphernalia).7,9 Activation of the amygdala during conditioned craving is consistent with its general role in conditioned stimulus-reward associations,29 and more specifically, with the observation that amygdala lesions in animals impair the cue-mediated acquisition4 and reinstatement5 of cocaine-seeking behavior. When attempting to correct for arousal, vividness of memory, and attention-grabbing processes by use of the anger control condition, amygdaloid activation was not associated with drug use imagery. The differential craving-related amygdaloid activation for contrasts to the different control conditions (Figure 3) suggests that the amygdala plays an additional significant role in the arousal related to drug cue exposure. An alternative explanation for the differential amygdaloid activation between contrasts being related to anger responses to drug use imagery is supported neither by self-reports of anger related to drug use imagery nor by anger-related amygdaloid activation from this study (data not shown) and that of a recent separate PET study.30 Interestingly, amygdaloid activity did not correlate significantly with self-ratings of induced cocaine craving in either the region of interest or pixel-by-pixel correlation analyses, raising the possibility that amygdaloid involvement in conditioned cocaine craving varies between individuals. The craving-related activation of the amygdala and the closely interrelated subcallosal gyrus, insula, and ventral striatum may reflect a neural system underlying the conditioned incentive, autonomic, and visceral corollaries of cue-induced cocaine craving. The drug cue–induced activation of the anterior cingulate gyrus and nucleus accumbens area may reflect an anticipatory state31 or reward expectancy32 associated with drug craving. A craving-related activation of the prefrontal association cortex was conspicuously absent from our PET study of internally generated cocaine craving. A prior PET study of cocaine craving induced by generalized external drug cues (ie, videotape, drug paraphernalia) indicated an increased metabolic activity of the bilateral dorsolateral prefrontal cortex that was positively correlated with self-ratings of cue-induced cocaine craving.7 A recent fMRI,8 but not PET,9 study of cocaine craving provoked by generalized external cues also reported a craving-related activation of the dorsolateral prefrontal cortex. We did observe similar activations of the left (Brodmann area [BA] 46) and right (BA 6 and BA 44) dorsolateral, prefrontal, and temporal cortices (BA 21), and of the left cerebellum in the normalized difference images comparing the neutral imagery control condition and the rest condition; neutral scene imagery in our study was not associated with cocaine craving. This contrast highlights those brain regions involved in the recall and imagery of autobiographical memories33 and suggests that the dorsolateral prefrontal activation sometimes attributed to external cue-induced drug craving7,8 corresponds to the attempt of addicts to link their associative memories of drug use to the generalized external cues, rather than to the provoked state of cocaine craving. The brain activation sites associated with cue-induced cocaine craving (Table 1) exhibit many similarities with brain foci of fMRI signal change identified in a recent study of post–cocaine administration euphoria and drug craving in cocaine abusers.34 Similarities include increases in insula, subcallosal gyrus or nucleus accumbens, hippocampus, anterior cingulate, and brainstem, and decreases in the medial frontal and temporal cortex. The cocaine-induced cocaine craving that provokes binge drug abuse and the conditioned cue-induced cocaine craving that provokes relapse following abstinence may thus share at least some neural substrates. In the fMRI study of cocaine effects,34 only the signal changes in the nucleus accumbens/subcallosal cortex (positive) and amygdala (negative) were however differentially correlated with the time course of self-rated craving following cocaine administration. The activation of the amygdala during cue-induced cocaine craving in this and prior7,8 studies relative to the amygdala deactivation associated with postcocaine craving34 may reflect differences in the conditioned vs unconditioned nature of provoked drug craving. Alternatively, the amygdala may be activated in response to the incentive rather than reinforcing properties of cocaine, and perhaps further, that cocaine use suppresses the anticipatory increases in amygdala activity. These possibilities, however, are highly speculative and in need of empirical testing. For both the region of interest and pixel-by-pixel analyses of craving-correlated rCBF, negative rather than positive correlations with conditioned craving predominated; subjects reporting greater cue-induced cocaine craving exhibited the lesser rCBF. Whether these regions of activation inversely related to cocaine craving are thus indicative of adaptive rather than maladaptive brain responses to cocaine addiction will need to be determined by future studies. For instance, the localization of negatively correlated sites in the autonomic-related35,36 cortex suggests an adaptive response to physiological arousal states associated with drug craving. While the brain-wide pixel-by-pixel correlation analysis revealed frontal, temporal, occipitotemporal, thalamic, and cerebellar sites significantly correlated (P<.01) with individual subjects' imagery-induced cocaine craving, many of these sites were similarly correlated with imagery-induced anger. Because subjects experienced little or no reported cocaine craving in response to anger scene imagery, those frontal and temporal cortical sites that seem to be unique to imagery-induced cocaine craving (Figure 4) are worthy of emphasis in future studies of craving-related brain activity. As personalized internal cues, autobiographical memories of drug use represent motivationally powerful conditioned drug cues.37 The conditioned craving response elicited by guided imagery of these cues was associated with a network of limbic and paralimbic activations. By defining where in the human brain the neural correlates of cocaine craving are localized, these results further the understanding of how the cocaine-dependent human brain craves cocaine and how drug craving can be arrested. Several limitations of this study need to be considered. As a complex state, conditioned cocaine craving represents a challenge to attempts to define those neural activations related to its motivational state. A limitation of this, or any extant imaging study, is the nonnaturalistic nature of the exposure to drug use reminders in a scanning environment. In the present study, a guided mental reenactment of personal behaviors and sensations associated with cocaine abuse was used to elicit a conditioned drug craving response. This individualized approach, however, represents only an approximation of the actual contexts of cocaine abuse that varies with the individual ability to reexperience by mental imagery the actual experience. The use of a mental imagery questionnaire as a screening tool was used to attempt to minimize this variable ability. An additional limitation of the study was the use of a fixed rather than random order of presentation of the scene imagery conditions in a repeated-measures design, and the resulting potential confound posed by an order effect to the use of condition contrasts to define craving-related changes in brain activity. This design was used to better assess and control for the anticipated larger confound of a carryover effect between conditions. Like the majority of PET studies of similarly small sample size, activation sites identified in the contrast analyses did not survive a correction for multiple comparisons.38 We therefore attempted to establish further the relationship between task-related chances in rCBF and cocaine craving using a secondary pixel-by-pixel analysis.28 This analysis minimized potential confounds posed by the limitations of the control conditions in the primary contrast analysis. To identify shared activations indirectly related to cocaine craving and nonshared sites proposed to be related to cocaine craving, correlation pixel maps for the drug use and anger imagery conditions were compared. A criticism of the use of guided imagery of personal drug use to provoke cocaine craving, compared with more conventional approaches using videotapes simulating drug use and drug paraphernalia, is that the stimulus is not standardized. The present approach, however, was alternatively designed in attempting to standardize the craving response by using individualized cues. Used in the specific context of a PET scanner, script-guided imagery, compared with videotape or paraphernalia cues, permits the acquisition of images in the absence of cue-related sensory stimulation, the use of conditioned stimuli better matched to the integration time of image acquisition for the short-lasting conditioned craving response, and the generation and comparison of control conditions. A head-to-head comparison of these 2 techniques would be of interest to the larger field of empirical analysis of drug craving associated with addiction. Accepted for publication September 5, 2000. This work was supported by grant DA 11771 from the National Institute on Drug Abuse, Bethesda, Md. We also thank Scott Grafton, MD, for image analysis software and advice, and Delicia Votaw, BS, CNMT, Margie Jones, BS, CNMT, and Michael White, BS, CNMT, of the Emory Center for PET. Corresponding author and reprints: Clinton D. Kilts, PhD, Department of Psychiatry and Behavioral Sciences, School of Medicine, Emory University, 1639 Pierce Dr, Suite 4000, PO Drawer AF, Atlanta, GA 30322 (e-mail: sdpcdk@emory.edu).